Describe why trust is at the heart of our business. Explain how our customers drive customer success and innovation. Explain how equality makes a difference for everyone. So we’ve been formally introduced and you know a bit about what we do. Now let's move on to the part where we talk about what makes us stand apart. When it comes to trust, nothing is more important than the open, transparent relationship Salesforce has with our customers, partners, and community. Salesforce began as a company to serve underserved customers. In 1999, enterprise software was notoriously costly, complicated, and limiting. Even big companies who could afford enterprise software were left fighting upstream, and small businesses were left out of the equation altogether. Salesforce started with a novel idea: why can’t buying enterprise software be as easy as buying a book on Amazon.com? How can we make it easier for customers everywhere to achieve their goals? From these groundbreaking ideas, Salesforce pioneered the pay-as-you-go business and technology models that allow us to serve all customers everywhere. We’ve evolved our entire business model around our customers’ success. Their goals are our goals. Their feedback is our directive. We aren’t successful unless they’re winning at what they do. It’s this symbiosis that keeps us true to what we set out to do. 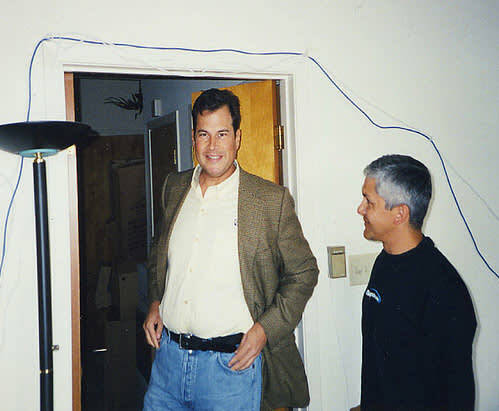 Here's a picture of Marc Benioff in 1999. We’ve come a long way since then. What broke the mold in those days is now the key to hundreds of thousands of successful customers today. Growth is based on mutual success. We help our customers grow, which is how we deliver customer success. In turn, we grow from that. We became a leader in cloud computing because we knew that it had the power to make doing business better for our customers. We were the pioneers of cloud computing in those days, but we didn’t do it for the guts and the glory. We did it for our customers. Cloud is still the medium for everything we do. This means all our focus is on innovating the best apps and platform technologies for our customers. This is what we do, all day, every day. Every one of our customers takes Salesforce and transforms it into a unique tool to help them help others. Whether it’s helping indie artists get their start, delivering a groundbreaking service to other companies, or enabling someone to buy their first home, it’s our customers’ goals for their customers that motivate us to do what we do every day. That’s why innovation on our end is so key. Our customers drive us to be more innovative. When we invest in the cloud, when we listen to our customers and continuously evolve a platform on which they can accomplish whatever they set out to do, we’re investing in their success. To us, the business of business is not business. The business of business is to improve the state of the world. But can a publicly traded company do well just by doing good? Our experience tells us that it can. That means we’re invested in our stakeholders—not just our shareholders—which includes employees, partners, customers, and the communities they live in. 1.8 million hours of community service. 30,000 nonprofits and education organizations use our products. In fact, our 1-1-1 model has been so successful that over 1,300 companies have taken the 1% pledge to join us in giving back. When you do business with us, you’re doing good for your customers, and good for the world. When it comes to what makes us who we are—Trust, Customer Success, Innovation, and Equality—these four core values drive why we do what we do every day.